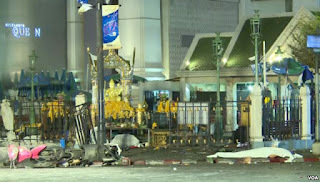 At least 15 people were killed and many injured when a bomb exploded in the evening today outside a popular religious shrine in Bangkok, local media reports said. Thailand's defense minister said bombers had argeted “foreigners'' to try to damage the vital tourist industry. 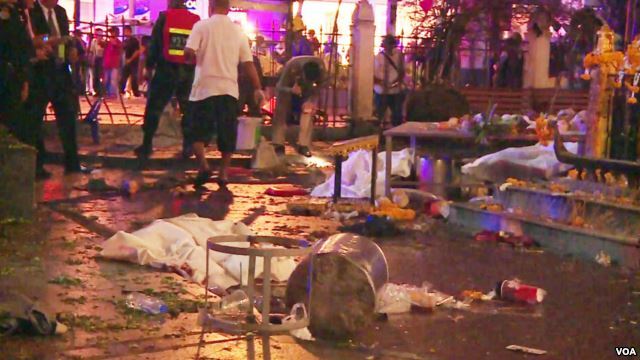 “It was a TNT bomb... the people who did it targeted foreigners and to damage tourism and the economy,'' Prawit Wongsuwong said. At least two bombs were found at the scene, said Major General Weerachon Sukhondhapatipak, a spokesman for Thailand's ruling junta. He said at least one bomb had detonated. 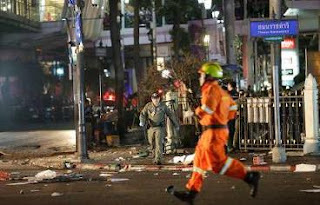 Thai PBS television said at least 15 people were killed. Weerachon said dozens were injured, and that some foreigners were among the injured. Body parts were scattered across the street after the explosion outside the Erawan Shrine in the downtown Chidlom district, an AFP reporter witnessed. Charred and shattered motorcycles littered the scene, along with broken glass. The Erawan is a popular shrine to the Hindu god Brahma but is visited by thousands of Buddhist devotees every day. It is located on a main road through Bangkok's commercial hub and is surrounded by three major shopping malls. 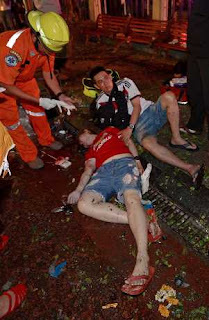 Many of those who suffered injuries in the explosion in the Thai capital, Bangkok in the evening today were reported to be mainly Asian tourists. 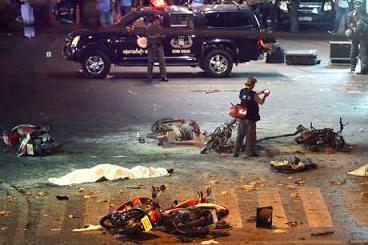 Most have been taken to Police General Hospital and Chulalongkorn Memorial Hospital, the Bangkok Post reported. A wounded person receives first aid at the site of a bomb explosion in the Thai capital, Bangkok, in the evening today. Reports from the city said a motorcycle had been rigged with explosives. Reports in the local media also said an explosive device had been rigged to a utility pole. The explosion was near the Erawan shrine at an intersection in the city. A police investigator records evidence at the scene of the bomb explosion in the Thai capital, Bangkok, in the evening today. Witnesses reported seeing body parts scattered at the site.